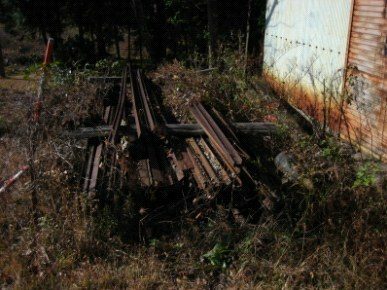 Rail gets another CRC. Third time lucky? 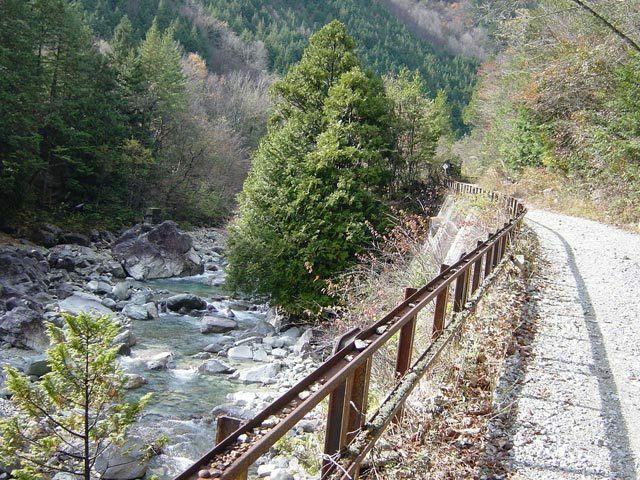 The Nojiri Forest Railway runs alongside the Kiso River. A branch from this line heads up the Atera Valley. The track layout close to the modern Nojiri Railway Station on the JR Chuo Line was complex with a large logging yard adjacent to the mainline. Nojiri Railway Station is shown below as a white line on the map. 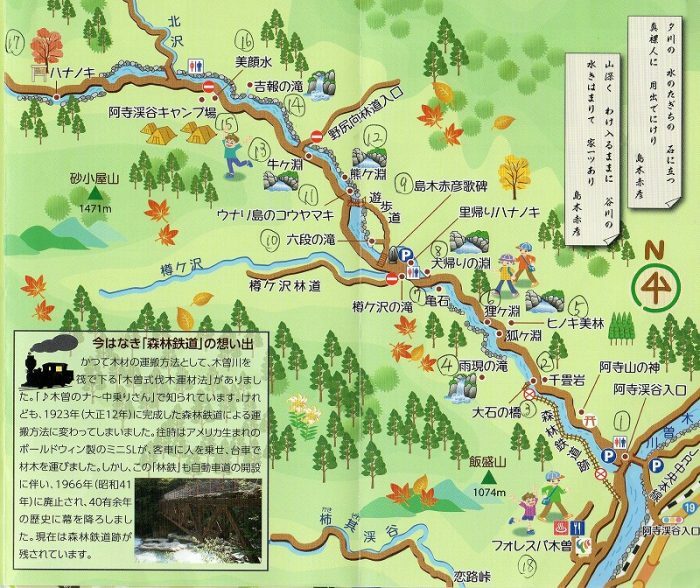 The red dot next to it is the logging yard.Narrow gauge lines in the area of the Atera Valley and the Kiso Valley confluence. Railways in the immediate vicinity of Nojiri Railway Station. The green lines are the 762mm-gauge lines. To the North of Nojiri Railway Station a short stub line led from the logging yard across a bridge to the Nojiri Forestry repair shop and Forestry Office. 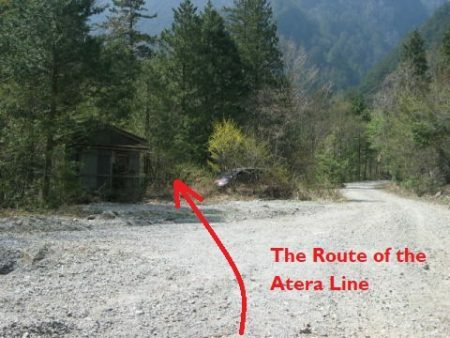 The location of the repair shop and forestry office is marked with the letter ‘A’. It is from this point that we start our survey of the lines in this area.The end of the line was in the vicinity of these buildings.This view looks back towards the forestry yard from what was the line of the railway and is now a single lane access road.The mirror in the previous image can be seen to the right of this photo. 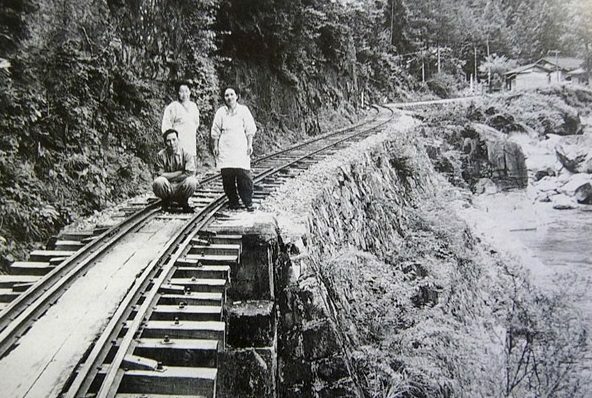 The railway from the forestry depot crossed the lower road in this image and the road on the left-hand side of the picture on a bridge which had three spans. 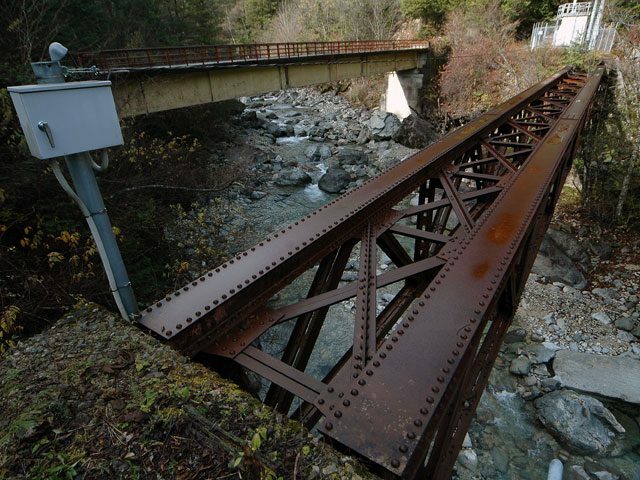 The shorter side-spans were made of concrete the longer middle span of steel girders.The bridge in place. The road layout is unchanged. The logging yard adjacent to Nojiri Railway Station is off to the left of this picture. The three roads converge on the location of the photographer and travel under the JR Chuo line and yard in a tunnel. This Google Streetview image looks back into the logging yard from the road at it main entrance to the Southwest.This picture is also taken from Google Streetview and is taken from the same location as the previous image but looking to the East across the JR Chuo Line.And this image shows the routes of the two lines which left the yard at its Southwest corner. 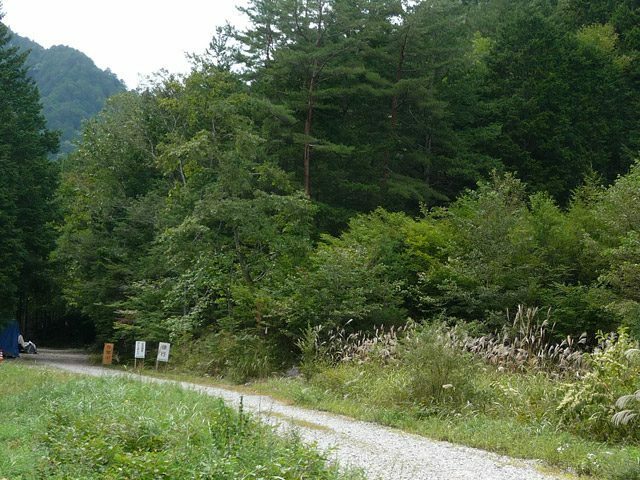 The first followed the road to the left of the image alongside the JR Chuo Line, the second followed the road alignment on the right of the picture.The route of the first line follows this road. 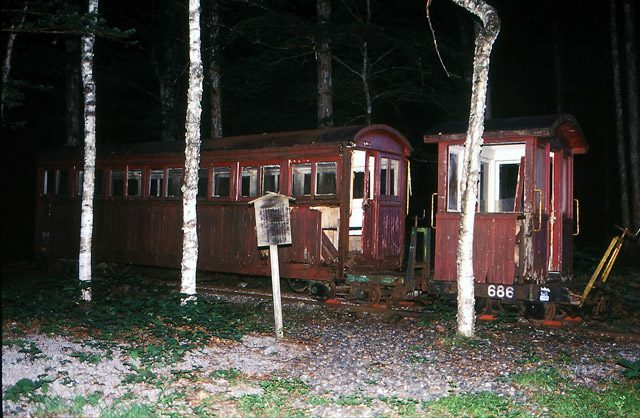 Initially its course was roughly parallel tot he main Chuo Line. 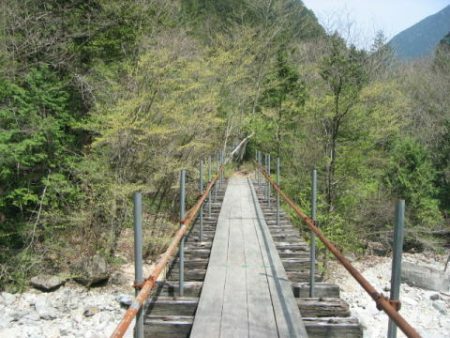 but later, after crossing a watercourse it followed that watercourse down to the Kiso River.The watercourse is on the right, the old railway route is the route of the modern single lane road.The bridge shows the location of the Kiso River and the route of the Atera Valley can be seen leaving the Kiso River Valley at this point.The line continued alongside the Kiso River for a short distance. 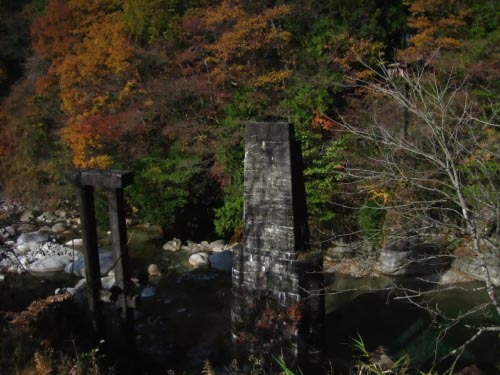 The image above shows the old bridge as seen from the road bridge over the Kiso River. 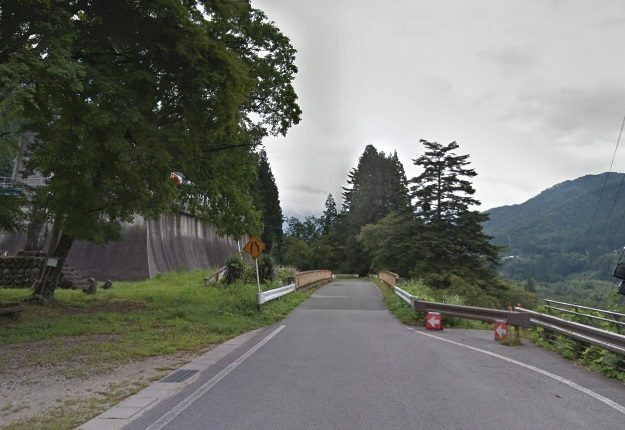 This image is from Google Streetview. 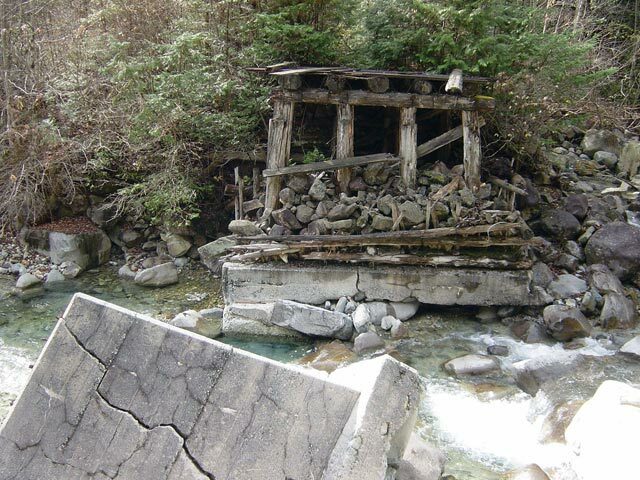 While the approach embankment has removed, somehow the bridge has remained. 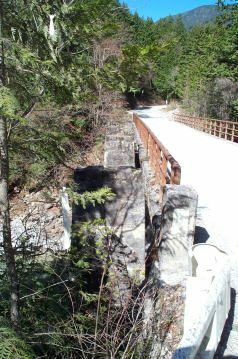 It is interesting that the bridge is a mixture of different construction types. 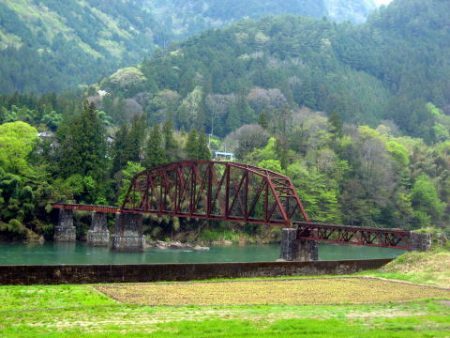 From the Nojiri bank of the river: a Warren Truss is followed by the large span open arched-truss bridge and then two plate-girder spans. The teo plate girders are on a curve to the left. 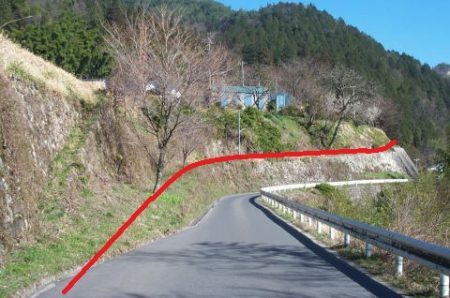 There is no super-elevation on the curve so trains must have passed across the bridge carefully at slow speed. . 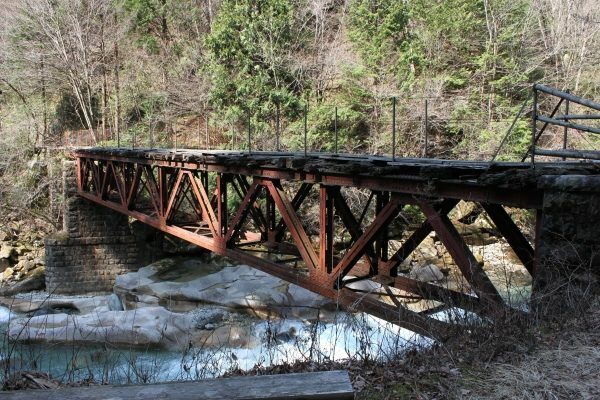 The size and complexity of this structure is indicative of the amount of money to be made in the early 20th Century from forest logging operations in the Kiso Forest. These three satellite images above cover the length of the line as shown on the sketch map above. 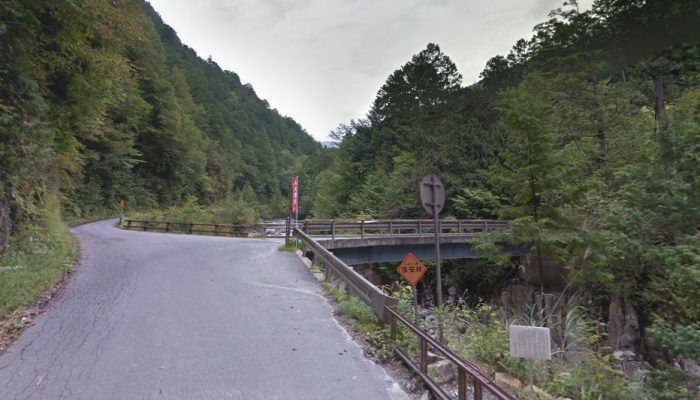 The same bridge appears in this Google Streetview photograph taken from the forest road. 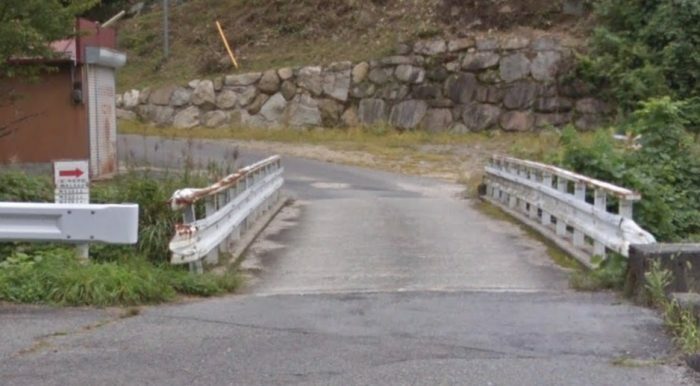 Google Streetview shows the bridge again. 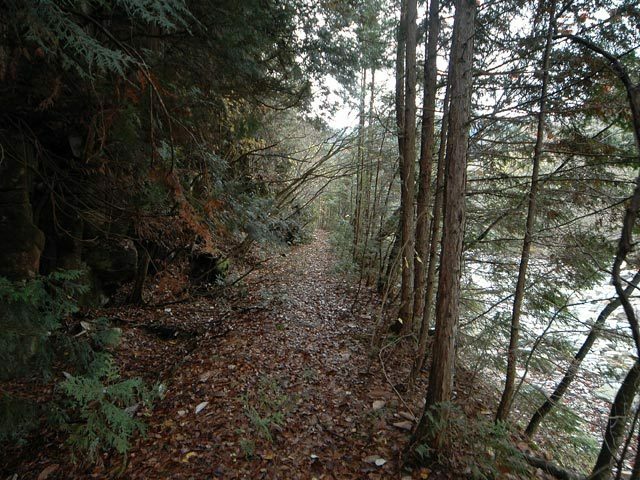 This time the formation/track-bed is visible adjacent to the forest road as the line turn upstream after crossing the river. the picture below shows this in more detail. The modern single-lane road now sits on the track-bed of the old railway which heads upstream on the East bank of the river. The image below is taken at a large modern car park which provides access to some of the most beautiful river gorge pools that you might imagine. 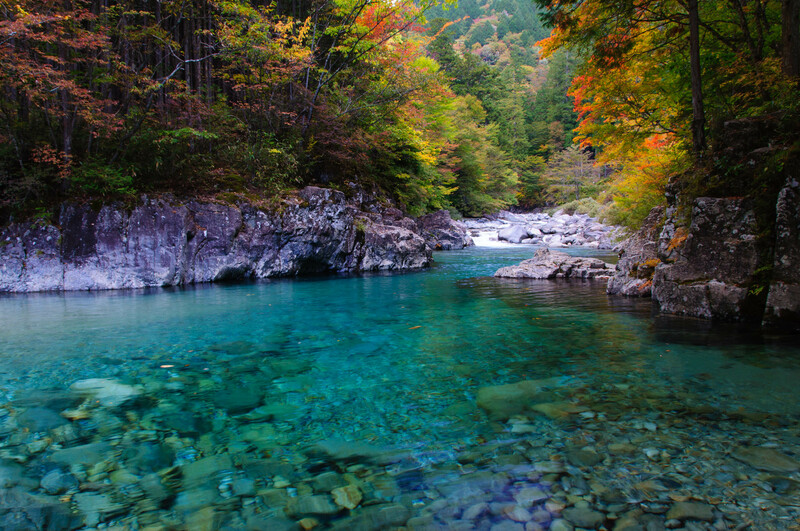 Typical of these pools is the one in the following image. The railway continued up the West bank of the Atera River. 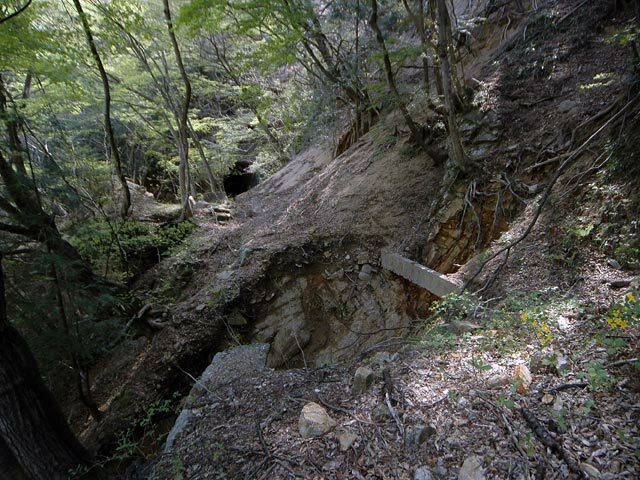 Soon after this the track-bed becomes increasingly difficult to follow with a variety of different collapses and small bridges which no long are accessible. The line continued a significant distance further up the valley as the map below shows. A schematic plan of the hairpin bends on the line. It remains accessible to some degree as far as the red ‘x’ marked on the map above. 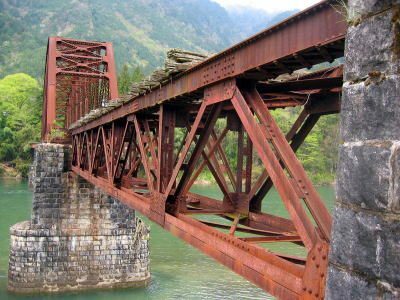 At that point the railway crossed the Atera River once again. 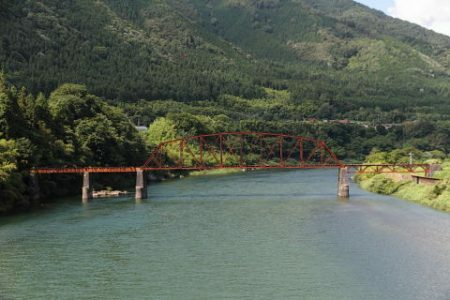 The bridge is shown below.Atera River Bridge No. 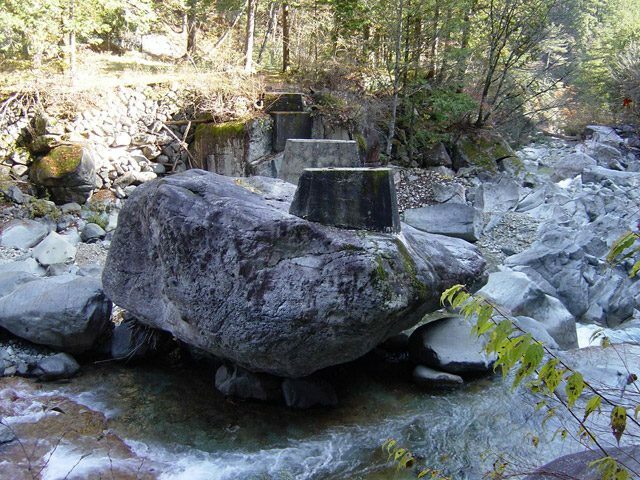 5 (阿寺川第5号橋梁). The ongoing route of the railway. 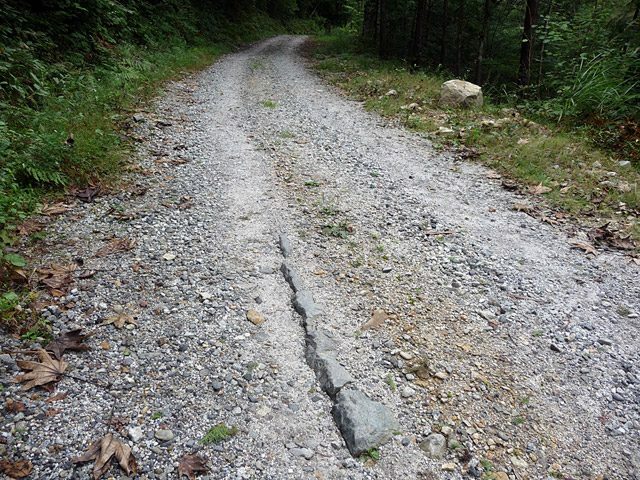 The grey line is the gravel forest road. The route continues to follow the Atera River Valley. 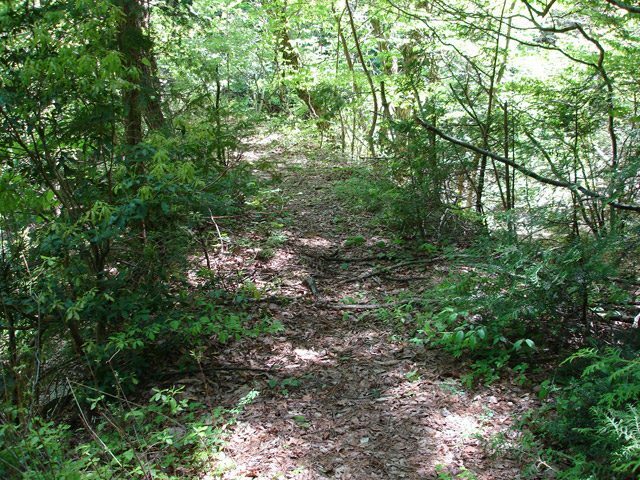 Its route matches that of the forest road except where gradients are too steep, as below. 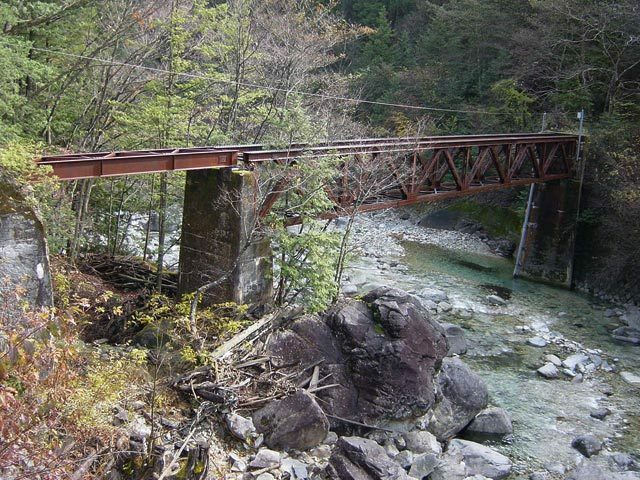 The website “rintetsu.net” continues to follow the route of the old railway right along the valley floor. For much of the distance there is little to see other than the gravel forest road. Along much of this section of the route a tarmac road is all that is left of the old railway route. 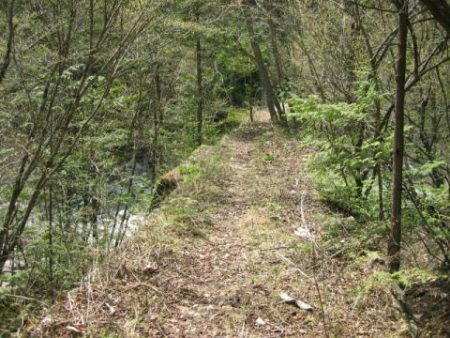 In the image below, the track-bed was roughly at road level. Travelling beyond this point road-widening has occurred and the route of the old railway has been lost. 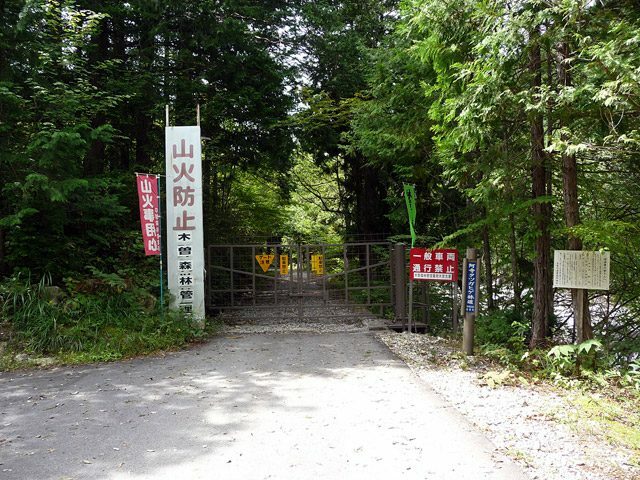 The access to the Shirayama Shrine can just be seen in the adjacent picture. 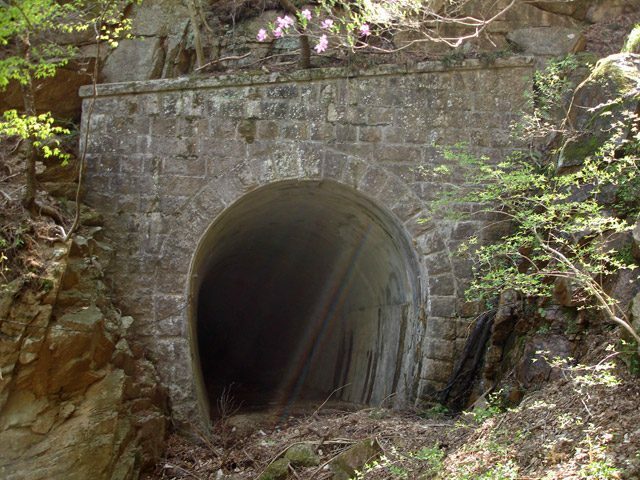 The railway travelled below this shrine and above the road. The line continued above the route of the road in the valley. 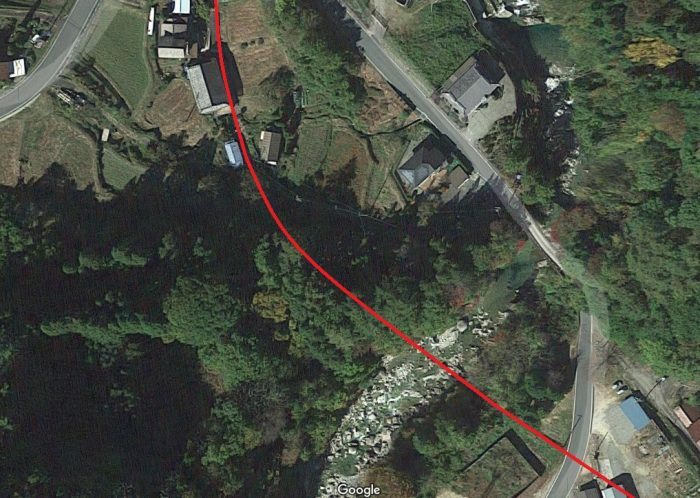 The road turns through two hairpin bends as it seeks to gain height and the line of the old railway crosses its path as shown by the red line below and in the following picture.The approximate line of the old railway is shown on the adjacent plan. 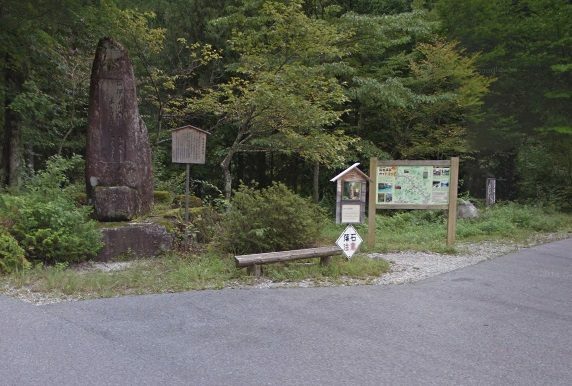 The location of the two Google Streetview images above is marked by the arrow and the red text. The most likely route of the railway is that marked by the red dots on this plan and by the red arrows on the Google Streetview image below. The adjacent satellite image probably gives the best perspective on the arrangement of the railway tracks as the railway gained height at this location. North of this point the old railway track-bed is most likely to have followed the route of the present tarmac road only just above it on the hillside as show below. 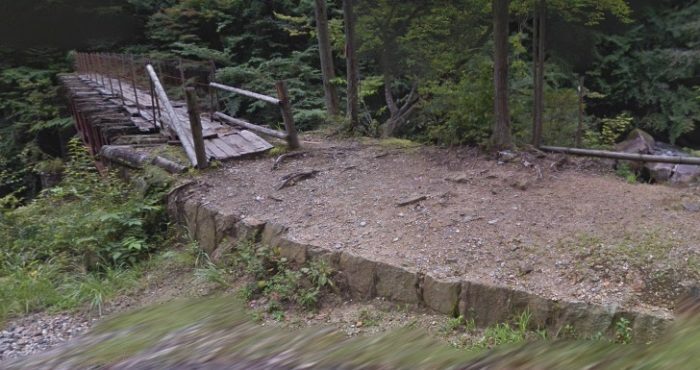 The line appears to have travelled above the retaining wall at the roadside but below the just visible revetment on the top-left of the Google Streetview image. 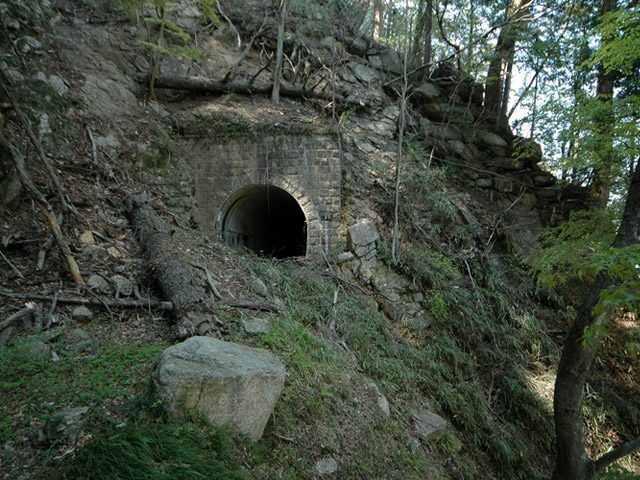 From this point, for a time, the route of the old railway is hidden in undergrowth on the hillside above the road. The route continued to follow the road for a little while further before heading away to the West. 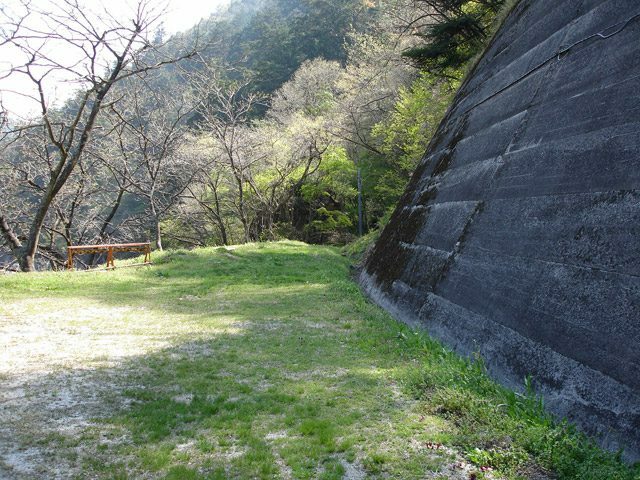 To gain the necessary height on the hillside, a series of hairpin bends in the railway were necessary. 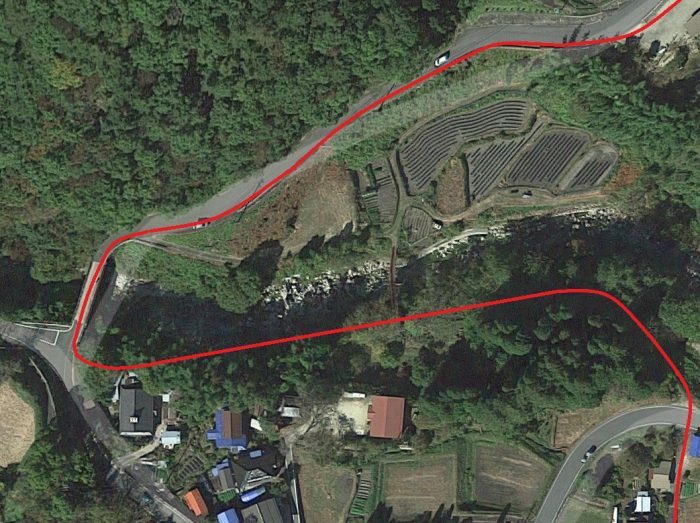 The satellite image below shows the presumed trajectory of the railway as it climbs the hillside. 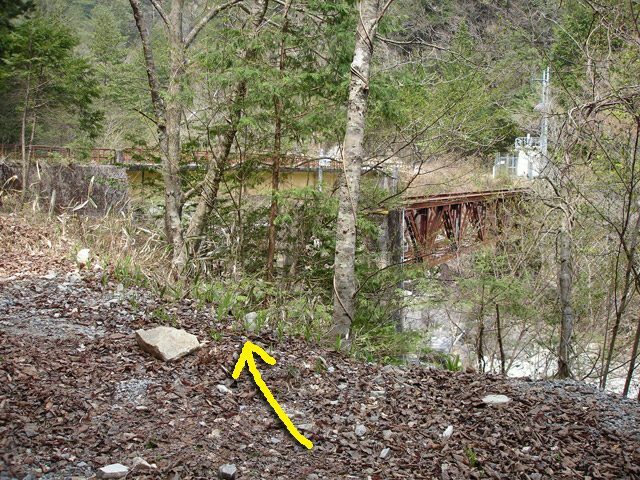 The adjacent image show the likely path of the railway as it returns to meet the relatively steeply climbing valley road. The blue lines on these two images are the Streetview traces on the Google Earth satellite images. 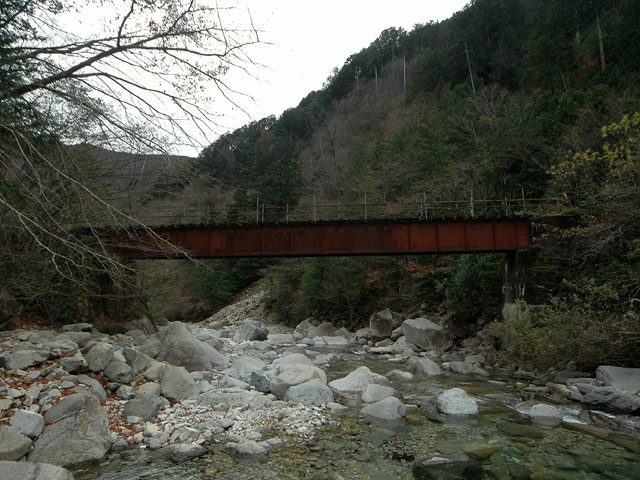 The image immediately below shows the present road bridge at the location where the old railway crossed the river. 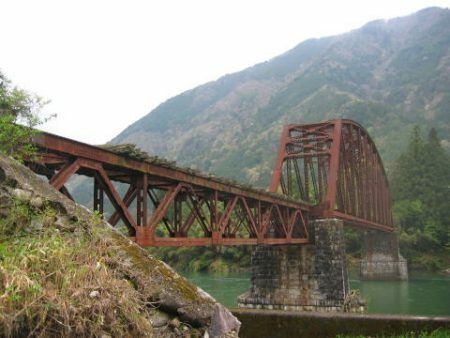 The railway only continued a few more kilometres to the north of this bridge on the east bank of the river. For the majority of its remaining course the old railway track-bed has become the modern single-lane forest road. 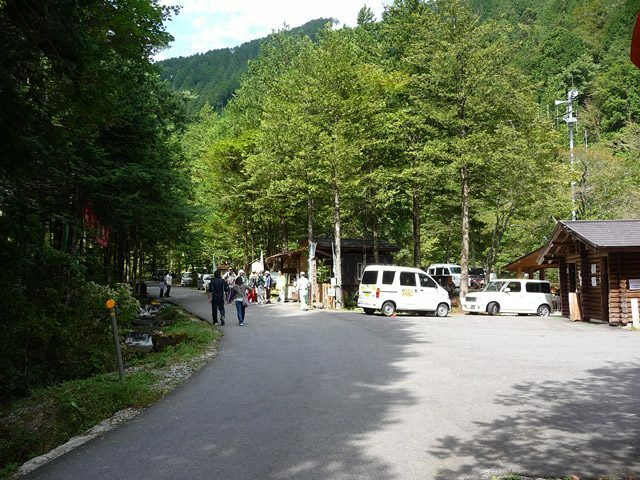 http://rintetsu.net/nagano_06/nojiri06/nojirimap_2.html, accessed on 22nd February 2019.
http://rintetsu.net/nagano_06/atera01/atera01.html, accessed on 22nd February 2019.
http://rintetsu.net/nagano_06/nojiri00/nojiri_ns01.html, accessed on 22nd February 2019.
https://haikyo.info/s/10766.html, accessed on 23rd February 2019.
http://www.geocities.jp/tentacles344/kisogawakyoryo.html, accessed on 23rd February 2019.
http://nishimiyaushiro.web.fc2.com/haisen/nojiri1.html, accessed on 23rd February 2019.
http://kyuragi2011.blog.fc2.com/blog-entry-137.html, accessed on 23rd February 2019.
http://kotityobunsitu.blog135.fc2.com/blog-entry-76.html?sp, accessed on 23rd February 2019.
http://rintetsu.net/nagano_06/nojiri04/nojiri1_kb08.html, accessed on 23rd February 2019.
http://rintetsu.net/nagano_06/nojiri05/nojiri1_kbn1.html to http://rintetsu.net/nagano_06/nojiri05/nojiri1_kbn3.html, all accessed on 23rd February 2019.
http://rintetsu.net/nagano_06/atera01/atera13.html, accessed on 24th February 2019.
http://rintetsu.net/nagano_06/atera02/atera15.html, to http://rintetsu.net/nagano_06/atera02/atera23.html, all accessed on 24th February 2019.
http://rintetsu.net/nagano_06/nojiri06/nojiri1_at01.html to http://rintetsu.net/nagano_06/nojiri06/nojiri1_at12.html, all accessed on 23rd February 2019.
http://rintetsu.net/nagano_06/atera01/ateramap_1.html, accessed on 23rd February 2019.
http://rintetsu.net/nagano_06/atera02/atera23.html, accessed on 24th February 2019.
http://nishimiyaushiro.web.fc2.com/haisen/nojiri1.html, accessed on 22nd February 2019.
http://www.rinya.maff.go.jp/chubu/press/kikaku/140411.html accessed on 24th February 2019.
http://www.soleil1969.com/ruinstop/adera/adera2.html, accessed on 24th February 2019.
http://minsyuku-matsuo.sakura.ne.jp/yorimiti28/aderakeikokuheiku30.html, accessed on 24th February 2019.
http://rintetsu.net/nagano_06/atera05/atera51.html, accessed on 24th February 2019.
http://rintetsu.net/nagano_06/nojiri07/nojiri1_ay03.html, accessed on 23rd February 2019.
http://rintetsu.net/nagano_06/nojiri07/nojiri1_ay06.html, accessed on 23rd February 2019.
http://rintetsu.net/nagano_06/nojiri08/nojiri1_y2t02.html to http://rintetsu.net/nagano_06/nojiri08/nojiri1_y2t12.html, all accessed on 23rd February 2019.
https://www.nagano-tabi.net/modules/enjoy/enjoy_76005001.html, accessed on 24th February 2019.
http://rintetsu.net/nagano_06/atera05/atera52.html to http://rintetsu.net/nagano_06/atera05/atera55.html, all accessed on 24th February 2019.
http://rintetsu.net/nagano_06/atera06/atera56.html to http://rintetsu.net/nagano_06/atera06/atera64.html, accessed on 24th February 2019.
http://rintetsu.net/nagano_06/atera06/atemap_3.html, accessed on 24th February 2019.
http://www.soleil1969.com/ruinstop/adera/adera5.html, accessed on 24th February 2019.
http://nishimiyaushiro.web.fc2.com/haisen/nojiri2.html, accessed on 23rd February 2019.
http://rintetsu.net/nagano_06/atera01/atera03.html to http://rintetsu.net/nagano_06/atera01/atera12.html, all accessed on 23rd February 2019.
http://rintetsu.net/nagano_06/atera06/atera66.html to http://rintetsu.net/nagano_06/atera07/atera70.html, accessed on 24th February 2019.
http://rintetsu.net/nagano_06/atera07/atemap_4.html, accessed on 24th February 2019.
http://rintetsu.net/nagano_06/atera08/atera78.html, accessed on 24th February 2019.
http://rintetsu.net/nagano_06/atera10/atemap_5.html, accessed on 24th February 2019.
http://rintetsu.net/nagano_06/atera10/atera2_16.html, accessed on 24th February 2019.
http://rintetsu.net/nagano_06/atera11/atera2_19.html, accessed on 24th February 2019.
http://rintetsu.net/nagano_06/atera12/atemap_6.html, accessed on 24th February 2019.
http://rintetsu.net/nagano_06/atera12/atera2_31.html to http://rintetsu.net/nagano_06/atera12/atera2_39.html, all accessed on 24th February 2019.
http://www.soleil1969.com/ruinstop/ruinstop.html, accessed on 24th February 2019.
http://www.soleil1969.com/ruinstop/tono/tono001.html to http://www.soleil1969.com/ruinstop/tono/tono003.html, all accessed on 24th February 2019.